Having attempted to break old lags out of Stangmoor Prison six stories back, the Master now gets to spring himself from gaol, a converted castle on the Isle of Wight, complete with colour telly and all mod cons. As the ultimate ‘mod con’ himself, the Master soon has the prison Governor helping him nick electronics gear from a nearby naval base in a bid to wake the titular monsters from the sub-aquatic slumber. Naturally the Doctor lands right in the thick of it and ends up getting locked up on the Moon Penal Colony for his unsuccessful attempts to persuade Mrs President of Earth that she’s being duped by Delgado. He’s rescued by, of all people, the Master, both of whom are then captured by the Draconians. 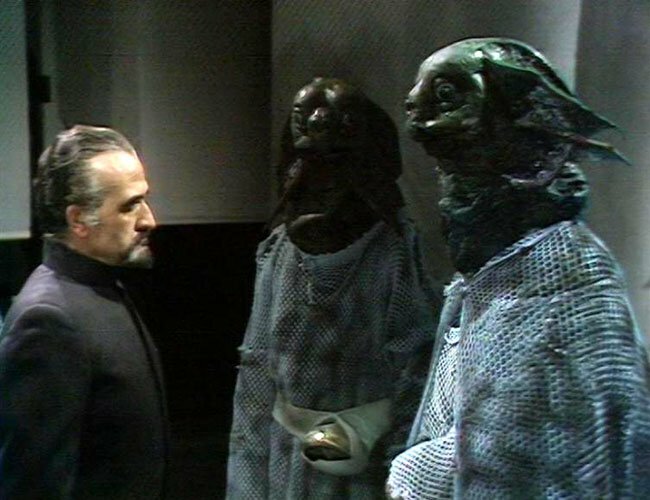 Doctor san reveals the Master’s machinations, leading to a reptillian reconcilliation with the Earth government. Together both Empires launch a fact-finding mission to the Ogrons’ homeworld where discover the truth. And a frightening orange duvet creature. Fed up after yet another failure and with being forced to work with animals and Mark III Travel Machines, the Master clears off, never to be seen again. At least not for four seasons.